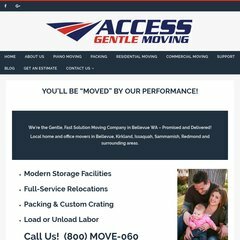 www.Accessgentlemoving.com - Access Gentle Moving — You'll Be "Moved"
Its 2 nameservers are ns55.domaincontrol.com, and ns56.domaincontrol.com. It is hosted by Godaddy.com Inc (Arizona, Scottsdale,) using Apache web server. Its IP Number is 64.202.163.153. PING (64.202.163.153) 56(84) bytes of data. A time of 60.4 ms, is recorded in a ping test.